Whats going on in the picture? poorly sealed exhaust vents + dryer vent (3 in total in attic) that are discharging onto the wood frame causing rot/water damage and mold growth. THIS IS A 4 Year old house that was not inspected when it was brand new. Now the warranty has run out and these issues are going to cost the homeowner who could have had the builder fix it for FREE. 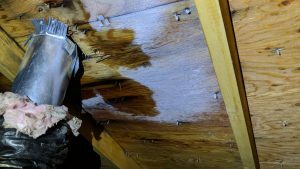 So much for the saved money by not hiring a home inspector to do their 30-day or Year-end warranty inspection.